« Giveaway winners are announced. 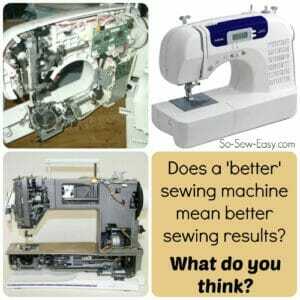 We looked in my earlier article on sewing tools at sewing machines. How much should you spend? Will buying an expensive machine make you a better sewer or get you better results. Or should you just go with the best machine your budget allows? I'm a frugal kinda gal and am sticking with my budget Brother machine, but that doesn't mean I might not want to upgrade some of the other more modest sewing tools in my collection. So in this series we will take a look at what I currently use and what I might upgrade to or in some cases downgrade to where a budget version works just fine too. Will upgrading any of these tools get me better results or save me time in the sewing room? Today the seam ripper. As much as we don't want to need one, a seam ripper often gets used more than we would like and is a very necessary sewing tool. I've always been ok with the budget models, but then I realised that in about 3 years of sewing, I've now collected about 6-8 seam rippers, and not one of them is any good any more. You can see here, I even started buying in bulk and bought all of those 4 blue ones at one time when I realised they just didn't stay sharp for very long. Time for a new seam ripper. Actually I wasn't disappointed because I've had my eye on a very special one – the gold star of seam rippers and one to last a life time. I figured in 3 years I had spent the same on all those cheap ones that I would have spent on a single good one. This is it – I have it on order from Amazon. 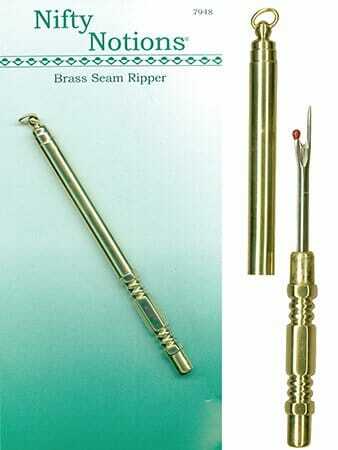 A brass seam ripper. I understand it has a lifetime guarantee, and it at any time you need a new blade, you can send it back to the manufacturer and they will replace it just for the cost of the postage. Mine has to arrive with a friend from overseas so I won't have it for a while yet but I'll tell you more about it once it arrives. I've a feeling I could do some real damage with this tool, and actually might make ‘mistakes' just so I could have the pleasure of using it. Anyone else got one? Hoping you'll tell me it's as awesome as I'm hoping for. I’ve only just read this about the brass seam ripper. I am definitely going to purchase one. As this was three years ago, I wonder how you are getting on with yours? 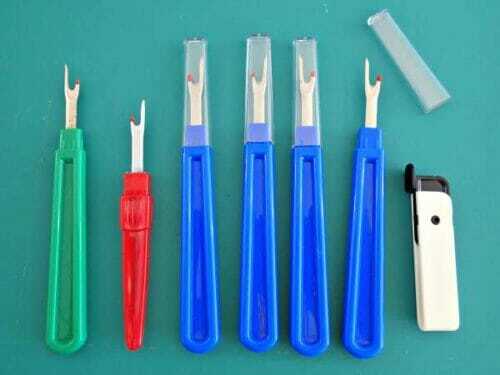 I have, like most of the readers here, a collection of less than good seam rippers. I make and sell zippered cushion inserts and covers, so I use a seam ripper a lot. The worst experience I’ve had was when I bought a new one – a Birch one, to replace one I’ve had for some years, and the new one was blunter than the old one! Not happy! Since then, I’ve been searching for something exactly like this, so it seams (pun intended) my search is over! I have one and I love it .simply skims through the seam and with no effort ,I didn`t get mine discounted or special offer but paid over £40 for it but I reckon it will outlast me and my sewing. THis is absolutely the best seam ripper ever devised. I picked one up many years ago at a Singer store in Anaheim, California with great trepidation at the then cost of $12.00. As I do a lot of alterations for people. removing stitching is extensive. This seam ripper has never let me down. It has dulled a wee bit, and I am going to order another one or two to have on hand when I am working with others so they will have one to use as well. I am also going to investigate the possibility of getting replacement heads and the tool to use them. Well worth every penny. Hi Susan, thanks for the feedback. I’m sure other readers will find it very helpful. Kind regards and happy sewing! I am curious if the manufacturer would supply the device with spare blades. its a bit of a stretch from Australia to be returning them to California. I would love one of these, if they are as good as you say. HI, Chris, this is an old post (2015) you would have to contact them directly to find out what are their return policy. It sounds like you are describing a suture scissor. It comes from the medical field. We use them quite often, especially after surgery. The side with the curve slips under the suture ( commonly called stitches ) against the skin. I have never even seen the brass one but I am going to get one!! (or two). I have a whole collection of (dull) seam rippers too (which is good- I tend to misplace them…and seam gauges. I bought a Nifty Notions brass seam ripper and I love it. I cannot find the address where to send it when I need a replacement blade. Do you have it and would you please share it. Thank you. I do not believe in the mythical stay-sharp-forever ripping tool. I have found over many years that the Clover version with the brown handle is the best. When it is blunt, it is blunt and nothing is going to change that. And as for cutting buttonholes, never use a seam ripper but always a special chisel used only for this purpose. My woodworking husband made one for me from scratch including the blade complete with the block to go underneath. Yes, I bought one a while ago, even though the price of shipping to Australia made it a very extravagant purchase. I love it! It is much sharper than the cheapies and slides through those stitches like a hot knife through butter. But be careful, it will slice fabric just as easily!! I have 16 dresses to replace zippers in you can come help :-). Oh good gracious! That’s a lot of unpicking to do. You’ll need a good light, a lot of patience and a good ripper for all those. I know where you’re coming from Karen, I am about 90% finished a memory quilt and it inspired me to dig deep and buy a few more expensive seam rippers. SO much work to rip apart a bunch of clothing. I never use a seam ripper to open a buttonhole. My grandmother gave me a fancy buttonhole chisel (like @Sue mentioned) about 40 years ago and it still works well because it can be sharpened. The only time I don’t use it is when my buttonhole is less than a half-inch long (the width of my chisel). Then I use embroidery scissors (thin and sharp). I don’t use a seam ripper for the very reason Deby mentioned – it’s likely to cut beyond the buttonhole, and if you place a pin to stop it and your hand slips, you’ve ruined the seam ripper (like hitting a pin with your machine needle). 30 years ago everyone made weighted chatelaines with their small scissors on one end and the seam ripper and other tools on the other. They were usually made of ribbon, and worn with ends dangling around the neck. I’ve been sewing over forty years & the brass seam ripper is the best I’ve ever used. Actually I bought a second one too after test driving the first one. The blade is thin enough to get under very tiny stitches & it is sharp! You will be thrilled with your purchase! They’re available on Etsy for around £14. They come from the US but are under the customs limit so no nasty surprises! Thank you so much, just ordered one. Hope it is the same. I always forget about Etsy because everything I find cant be shipped here. Mine has arrived thank you Diane. It was in a plastic bag not on a card like the Nifty Notions ones. I got it off Etsy. It was about £14 as you said opposed to £40 over here. It looks exactly the same as the photos on here. It is a nice weight, with a long slim point. Not at all flimsy. It looks as though it will do the job when needed. The little red bead on the end of the ‘hook’ is there to tell you when to stop ‘ripping’ the buttonhole. It also is a good idea to place pins perpendicular to the the length of the buttonhole you need to cut just so you don’t zip on past the length you need. To cut buttonholes cleanly go to the hardware store and purchase a chisel but remember to use a wood block underneath. Notion companies sell these little chisel/wood block sets but they cost at least triple what a single chisel at the hardware does. I use a surgical sickle shaped seam ripper which has a very fine blade but works wonders if you have to pick out serger seams. It slips in-between all the those threads like a hot knife through butter. That blade has kept sharp for over 20 years for me – but be careful as it will slice your fingers really easily too. I just ordered a fancy one as well. It is on it’s way from Australia. I ordered one that has a gorgeous handle! It is glass and colorful. I hope it cuts for a long time or can be sharpened. otherwise I have been using a scalpel with a curved blade. The blades can be replaced and for me that works a lot better as I dull them quickly! they seem to be the most used tools after my scissors! I do a lot of frog stitching! Rippit, rippit, rippit!!!! LOL!!!!! Well, I’ve been irritated with my seam rippers, so I ordered this one on Amazon! I have the brass one and may order the brass stiletto (don’t have a stiletto at all). I love the seam ripper. The blade seems finer than the others and I can get under the stitches easier. I have a ribbon tied around it and sometimes wear it around my neck. However, if I were using a long arm machine, I would definitely have to remember to remove my jewelry! Tip for when you’re opening a button hole or putting a hole in for snaps: put a pin perpendicular to the end of the button hole or end of were the snap holes need to be, just a hair inside the end. That way when you cut the pin acts like a “stop” to prevent you from getting a bit carried away if the ripper slips. Quality ALWAYS wins over cheap junk and high quality means YOU DON’T KEEP BUYING THE SAME JUNK OVER AND OVER, SO IT IS LESS EXPENSIVE IN THE LONG RUN! I’ve had a brass one for years. Good steel can be sharpened – take it to a sharpening shop! I bought a pair of vintage, but good quality, buttonhole scissors many years ago and got them sharpened, and they are adjustable to your buttonhole length so you can’t cut beyond the length you’ve set them for. Priceless! Buy the best quality in everything, and it will always serve you well. That dictum has served me very well for my entire adult life. If I wanted a new model of something with enhanced or new features, I passed along my old to my kids to use or someone else who needed something better than they had. Good quality has a long life. They still drive 1956 Chevrolets in Cuba because they were high quality, were well taken care of, and had new parts made when needed. Take a lesson from that. They still drive 1956 Chevys in Cuba because there was a trade embargo placed on Cuba by the U.S. in 1960. All imports were and are still stopped except humanitarian ones like food and medicine. I just use the one that came with the sewing machine. I use it a lot so I suppose eventually it will get blunt. Then I’ll look into investing in a better one, probably. 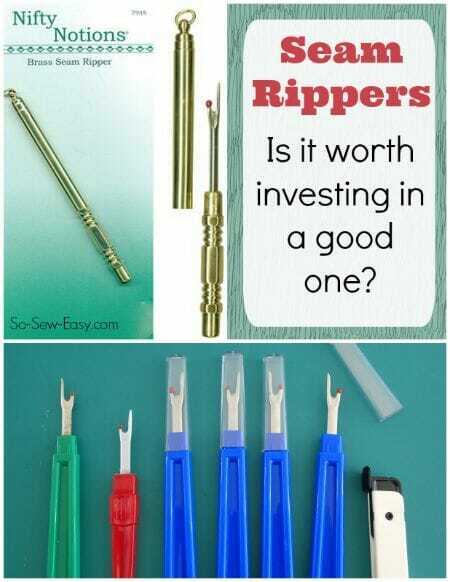 I would never use a seam ripper to cut open button holes or make holes for magnetic snaps. I use my trusty pair of nail scissors for that (kept only for sewing)as I feel I have more control with the scissors. I use my seam ripper only to unpick stitching. I have one and love it! But it is hard to see in my other stuff so I was thinking of messing a fob with a colorful bead or something. I didn’t know it had that warranty! Did I keep my package? ? By the way, it actually sounds like you used the wrong tool for the job at hand ..maybe a buttonhole knife would have been better or a small pair of snips? But if you choose to use a seam ripper to go through fabric again, a trick I learned a few years ago is to put a pin (or safety pin) at the end of the line you are slicing through so you don’t go too far. Good idea Brenda. Everyone should do this regardless of what kind of seam ripper they have. Can’t wait for Deby to let us know what she thinks of the brass seam ripper. It should be here any day now. I’m thinking although its thin, its going to have good weight to it so won’t feel flimsy. I’m going to be looking for all sorts of things to be unpicked.